Tonight, several of my family members, as well as Jews around the world, will begin the celebration of one of the better-known Jewish holidays - the festival of Passover. This seven day and seven night holiday celebrates the Israelites' exodus from Egypt, described in the OT book of Exodus. I will be doing a post later this week about the holiday itself, which is rich with tradition, ceremony, and ritual - some directly from the Bible, some not. But as I read through the Exodus account earlier this year, and thought about my Jewish friends and family preparing for this weeklong festival, something new struck me. The holiday of Passover is all about preparation - and it has been since the very first one. From God's command to Moses for the Israelites to choose a lamb a good four days ahead of time to slaughter and mark their doors with (Exodus 12:3-7), to the disciples' preparation of the upper room for the Last Supper (which was, of course, a Passover meal - Matthew 26:17-19), to some observant Jews who spend a week or more cleaning their home beforehand, removing every bit of leaven of any kind from the premises (Exodus 12:15), preparing for this time is crucial to celebrating. And shouldn't this be the case for everything - but especially anything related to the Lord? If the Israelites hadn't slaughtered the lamb, they not only would have not been taken from Egypt, their firstborn would have died. 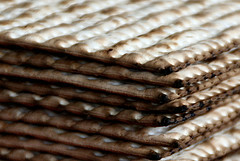 If my Jewish relatives do not remove the leaven from their homes beforehand, they will be disobeying the Lord - and could inadvertently eat something forbidden during Passover week. And, if we don't prepare our hearts and minds for our meetings with the Lord - whether they be time in His Word, prayer, a church service, or Easter Sunday - how can we expect to bless or be blessed? Preparation is key to our relationship with Him. Passover begins tonight - and Easter in less than a week. Have YOU prepared? I spent Saturday morning condensing Scriptures from a chronological Bible beginning with the Triumphal Entry through the burial of Jesus. We used it Sunday morning, reading "responsively" with Jesus, Pilate, Narrator, and All parts. While gathering pictures for the power point, I was freshly "moved" emotionally. What LOVE! It's so easy to jump from Palm Sunday to Easter & gloss over the heart of Jesus in the days between (even leading up TO the "Triumphal Entry" - which I suspect wasn't so "triumphal" for Him.....). Truly there is no transformation without sacrifice! Beautiful thoughts, Rebecca - and I love the idea of the responsive reading that way. Thanks so much for stopping by!